What do you call someone who copies someone else’s cow artwork and concepts? A copycat, or a copycow? During today’s visit to my local grocery store – Vons (otherwise known as Safeway) – I was shocked to witness infringement on two designs I’ve seen somewhere else recently. 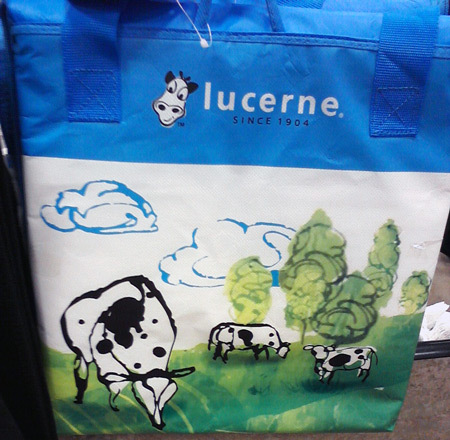 First, I present you with the cow cooler bag from Lucerne, or Vons, or Safeway. Same difference. I’m all for the idea of using cows on cooler bags because after all, cows are pretty cool. But Henry’s Marketplace beat them to it several weeks ago with their own cow cooler bag. 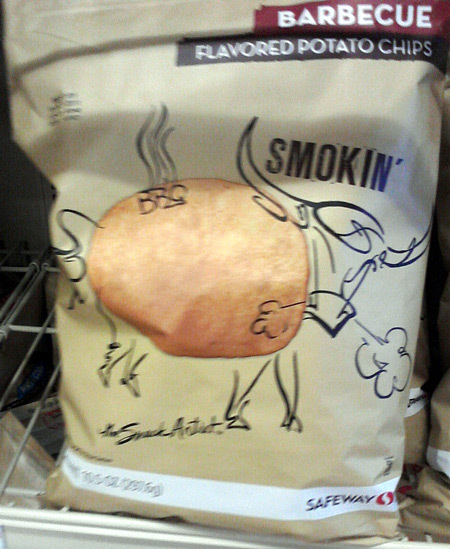 Then there was the bags of potato chips. Light colored and featuring cool illustrations of animals, including a coyote on one and of course, a bull on another. Check out the smokin’ hot longhorn! It’s beginning to look like COWS are literally taking over the grocery stores! Ah, what next?! Isn’t that the truth!? I find it ridiculous to see so many cows on so many products. Oh well, it sure helps me find daily materials for this blog!